Welcome to the Guntrainers site. Let me tell you a little about my background and my motivation for creating this project. 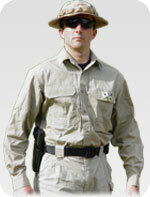 I am a student of various tactical firearms disciplines, including handgun, shotgun, tactical rifle and precision rifle. Although I instruct as well, I say I am a student because every one of us who teaches also learns while on the job. When we stop learning and growing our skills, we stagnate. Let's not do that. Americans continue to purchase guns for defense and sporting purposes. A firearm is undoubtedly a hazardous thing in the hands of an untrained user. Therefore, it is my mission to ensure as many gun owners as possible partake of training to ensure they can handle a firearm safely and with skill when the need arises. Through this website, I hope to help students connect with instructors. Students can register so that instructors can contact them. Likewise, instructors can register so that students can find them with a simple zip code search. Safety is a result of education. Skills result from education and regular practice with an experienced coach. LIST YOUR SERVICES FOR FREE!